7/30-8/7 Harrah’s, the D, Cosmo, Bellagio. Not necessarily in that order. Occasionally live. Discussion in 'Vegas Trip Reports' started by VivaSladeVegas, Jul 29, 2018. I bought a doob today on my way back to the monorail from Eureka. I no longer have a balcony. Time to work on my problem solving skills. Double Smoke Shack, Chicago Dog, and a peanut butter shake. No whipped cream...because my body is a temple. Last night was all about cruising around the strip. Up from Casino Royale to MGM, across to NYNY for a bite or 28,743 at Shake Shack...then rolled back down to Mirage and on home. 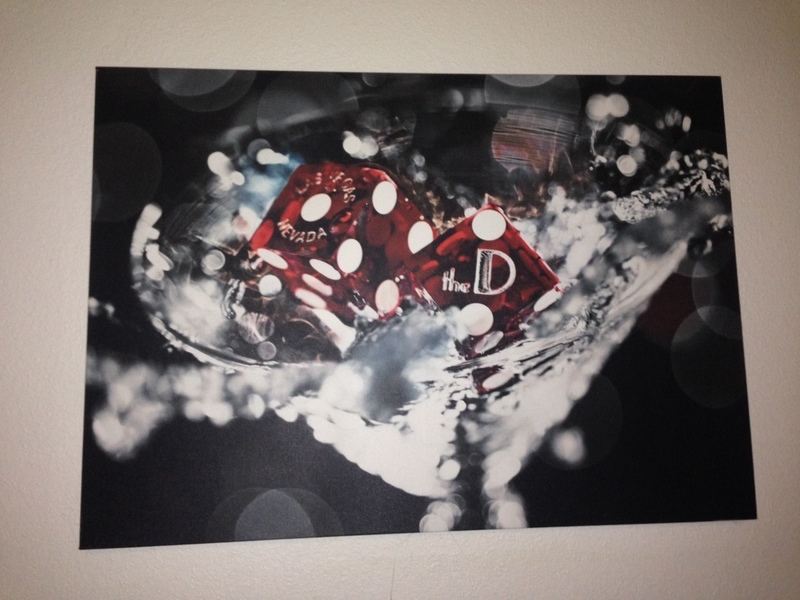 I gambled and drank while strolling. I came out a small loser on the former, and a big loser and the later. Great craps tables at Bellagio and Cromwell. I really love the Cromwell. My phone only made it out of my pocket for pictures while I was sitting down at Shake Shack and when I saw the queen of Canadian pop country. Checked in to hotel number 4. I gathered up some freeplay money from Binion's and four queens and the D and finally El Cortez. I'm keeping a running tally of freeplay winnings and will do something exciting with it all tomorrow night... my last night....poop. Suggestions welcome on how to gamble or otherwise use that cash. 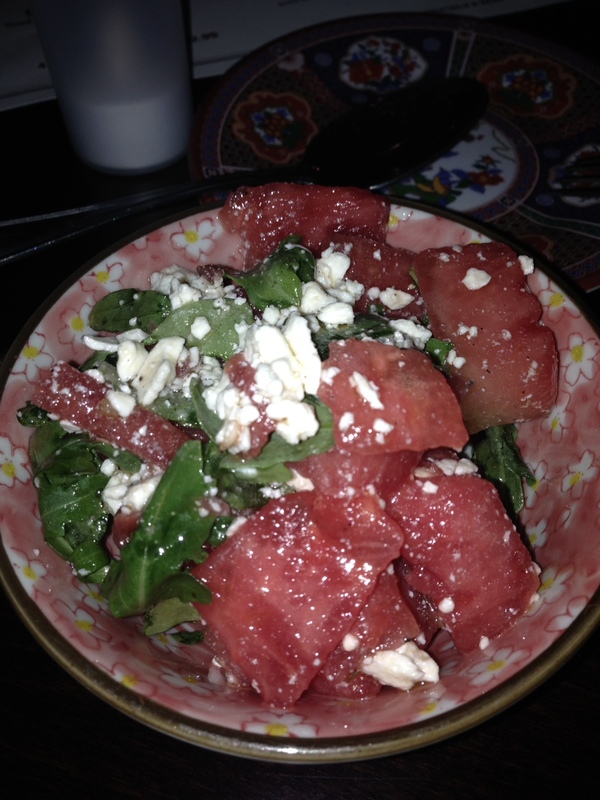 Watermelon salad...I've eaten a lot of watermelon salads this summer. Theirs was good. China poblano and a place back home have better versions. This was good. Try it. Hard to get a good picture in there, and honestly I didn't try too hard because I wanted this fucker in my belly NOW. It's a fried chicken bao. I wish I could get a White Castle style crave case of them. I had three items I was considering, the waitress steered me to the laksa. She's a champion driver. This was the best thing I've eaten all week. I'm drunk right now and my memory isn't great, but I'll try to reaffirm that tomorrow. Craps at ElCo and coin dropping excitement. Left a winner thanks to craps. I didn't hit it. If I had, I woulda run back over to Flock and Fowl with a bucket of quarters demanding a crave case of bao. I know...they're cashless...but how could they turn me down. It'd be a great story. Back to the D where I really kicked it up a notch. Back in the room now resetting my roll and thinking of heading back out...but it's so nice and chilled in here! There are some serious tropical microclimates in the d casino where the machines add 20 degrees. I saw two different moms walking down Fremont tonight holding their kids in headlocks. Not sure they were affectionate headlocks. Did I mention a Canadian magician did close up magic for me at a slot yesterday? I can't stop chuckling about it. I might be in the mood for some soup. The Yankees shoulda been a lock today. Texas too. I don't have any wins in the poker world to report, Harry! Not sure if I've chronicled all my losses....they sorta ran together. I enjoyed sterling brunch. Not sure I'd do it again. I'm still, literally, digesting the experience. I'll try to give you a more complete rundown. Played slots and craps in and around Harrah's with disastrous results today. Well, I'm down a few hundred but not a thousand so I guess it all depends on your definition of disaster. Baseball bets have not fared any better...I'm 0-5. Cleveland let me down big time today. I'd make some joke now about how the river caught on fire there in the 70's, but my heart isn't in it. I don't adhere to a daily gambling budget and I don't have a daily loss limit, however, I do sometimes stop and say, "Whoa....that'll be quite enough losing for the day." This is one of those times. But..good news, It's about half an hour away from a new day! Though losing sessions all, gambling was enjoyable. Nice rowdy but not obnoxious craps tables. I've also become a fan of the Animal House and Brady Bunch slots. Very fun. Harrah's is a video poker desert so I've mostly steered clear save for a few pokes trying for a big hand. Seriously, when I walked in this morning it was eye-stinging. Maybe someone turned the casino scent machine up to 11. Maybe I'm just used to it and I've taken on the scent myself and now I'm walking around like a Harris Casino Scent Renuzit. Or, more likely, the other smells of Vegas have wafted in and evened things out. Smells like cigarette smoke, weary travelers, beer farts and desperation. And, though Ivy was unable to help me out with a name of the scent, I look forward to our burgeoning guest/concierge text relationship. The chairs in the poker room at Planet Hollywood did a number on my back last night. Bourbon and aspirin are working well. To the airport shortly...maybe I'll wrap up and report when I get home. If not, thanks to everyone who commented and followed along and maybe I'll try this again some time. Great report! Thanks for taking us along! Just catching up on this TR. Sorry about your exit in the tournament. That margarita looks delicious. Kind of reminds me of an inverted 32b back in high school.